27. Herbert John EGAN (Thomas Joseph , John , 'unknown' ) was born in 1882 in Kensington, London. He died on 28 Nov 1938 in 3 Mandeville Place, Marylebone, London. He was buried in St. Mary's Cemetery, Kensal Green, London. Herbert John was also known as Herbert George. He was a commercial traveller. Up until his marriage in 1917 Herbert lived in the family home at 44 Barons Court Road, Fulham, London. After his marriage he and his wife, Winifred, lived for many years at 17 Mornington Avenue, West Kensington, London. Herbert is buried with his brothers Edmund and Philip. 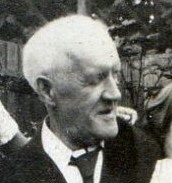 Herbert married Winifred BELL in 1917 in Brentford, Middlesex. Winifred died. 28. Marguerite Marie-Louise EGAN (Thomas Joseph , John , 'unknown' ) was born in 1885 in Fulham, London. She died in 1962 in Surrey. 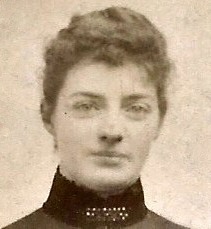 Marguerite married Edmund Samuel PENNING-ROWSELL in 1910 in Fulham, London. The marriage ended in divorce. Edmund was born about 1882 in possibly Chelsea, London. He died in 1964 in Kensington, London. Edmund owned a printing business in London. + 43 M i Edmund (Eddie) Lionel PENNING-ROWSELL was born on 16 Mar 1913. He died on 4 Mar 2002. 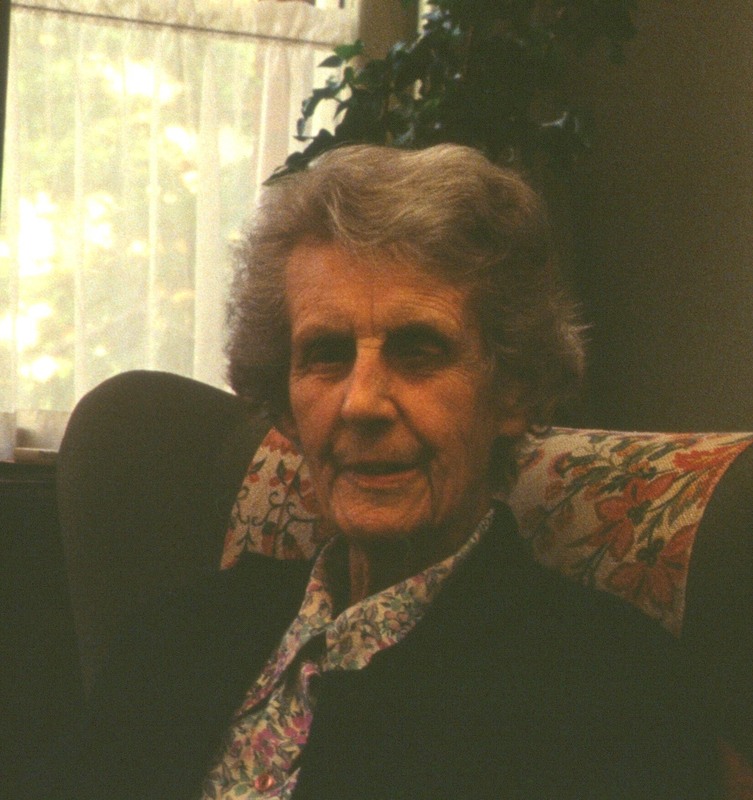 Patricia PENNING-ROWSELL was born in 1918 in St. George Hanover Square, London. She died in 1994 in Camden, London. 29. Philip Alfred EGAN (Thomas Joseph , John , 'unknown' ) was born in 1888 in probably Fulham, London. He died in Dec 1952 in Surrey. He was buried in St. Mary's Cemetery, Kensal Green, London. Philip's name on his marriage certificate is Alfred Philip, and his occupation was insurance broker. He and his wife, Rachel, were married by Philip's uncle Fr. Edmund F. Egan. Witness were Agnes L. Egan (presumably Philip's mother), W. Murray Graydon (presumably Rachel's father), R.C. Graydon (probably Rachel's brother, Robert), and Edmund T. J. Egan (possibly Philip's brother, although his brother was actually Edmund J. T. Egan). At the time of his marriage Philip was living at 44 Baron's Court Road, Fulham, London. By 1926 Philip and Rachel were living in Ockley, Surrey (from electoral register). Philip married Rachel Sloane GRAYDON, daughter of William Murray GRAYDON and Pearl Ellen BALSLEY, on 17 Jun 1911 in Church of the Most Holy Trinity, Brook Green, Hammersmith, London. Rachel was born on 21 Jul 1890 in probably Harrisburg, Pennsylvania. She died in Dec 1989 in Okehampton, Devon. At the time of her marriage in 1911 Rachel was living at 57 Comeragh Road, Fulham, London. In 1939 she was living at "Glenview", Carnon Downs, Truro, Cornwall with her mother, Pearl. It appears Rachel lived to be 99 years of age. John Edmund G. EGAN was born in 1912 in Fulham, London. He died. John may have been an only child and may have lived in Cornwall. John married Winifred RICHARDS in 1956 in Sturminster, Dorset. Winifred died. 30. Walburga Sybil Mary EGAN (Thomas Joseph , John , 'unknown' ) was born on 31 Jul 1891 in Fulham, London. We know that Walaburga and her husband, George, lived in the early and/or mid-1930s at 59 Maybury Mansions, Marylebone, London and were at 47 Atwood Avenue, Richmond, Surrey by 1939. 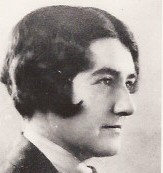 Walburga married George Eric Palmer EDWARDS in 1914 in Fulham, London. George was born on 2 Jun 1888 in Hampstead, London. He died in 1971 in Bridport, Dorset. George was a civil servant with the Inland Revenue. Diana E. C. EDWARDS was born on 20 Sep 1915 in Paddington, London. She died. Diana married John (Jack) RUMSEY in 1940 in Surrey North Eastern registration district. John died. 33. Constance Marie EGAN (Alfred Joseph , John , 'unknown' ) was born on 23 Dec 1891 in 47 Cotleigh Road, West End Lane, Hampstead, London. She died on 31 Dec 1975 in Oxfordshire. She was buried in Lower Heyford, Oxfordshire. Constance was a children's author. Her works include several books about Epaminondas, a character from folk tales of the southern states of the U.S., and stories about Jummy, the Baby Elephant. Constance also worked as editor of the women's magazine Home Chat in the 1920s, and from the 1950s until 1965 she was managing editor of The Coat of Arms, the quarterly journal of the Heraldry Society, founded by her son, John. The 1939 Register gives her occupation as journalist. She and her husband, Raymond, were living at the time at 54 Bayswater Road, Paddington, London. Constance married Raymond BROOKE-LITTLE, son of James BROOKE-LITTLE, on 22 Dec 1924 in Church of Our Lady of Grace, Grove Road, Marylebone, London. Raymond was born on 10 Feb 1884. He died in 1961 in Oxfordshire. Raymond, an electrical engineer, was a widower when he married Constance. He may have retired as an engineer by 1939 as the 1939 Register tells us he was a "lodging house keeper" at that time. The marriage was performed by Constance's greatuncle Canon Edmund Egan and was witnessed by H. A. Goldschmidt and Philip Thornton. Constance's address at the time was 7 Abbey Gardens, St. John's Wood, London and Raymond's was 21 Ladbroke Gardens, Kensington, London. Constance and Raymond had the following children. + 47 M i John Philip BROOKE-LITTLE was born on 6 Apr 1927. He died on 13 Feb 2006. 35. Mary Theresa BUTLER (Jane LYNCH , Mary Ann EGAN , 'unknown' ) was born on 29 Mar 1865 in 2 Duncan Place, Vineyard, Richmond upon Thames, Surrey. She died in Mar 1953 in Wandsworth, London. Mary was born in Richmond upon Thames, where her family lived briefly prior to moving to Kensington. Around the 1890s Mary's birthplace in Richmond, 2 Duncan Place, became 31 The Vineyard. ; and in 1994 one home was created from nos. 31 and 33 The Vineyard, forming an enlarged no. 31 (no. 33 no longer exists). At the time of the 1891 census, Mary and her husband, Thomas, were living at Albert Hall Mansions in Kensington which had been built by Thomas's father's company. They were still at Albert Hall Mansions at the time of the 1901 census (the surname appears as "Husey" on the 1901 return). By the time of the 1911 census Mary appears to have been living at the home of her father at 59 Rowan Road, Hammersmith with her six surviving children while her husband, Thomas, is listed alone at 150 Blyth Road, West Kensington. At the time of the death of their son Ted in 1917, by which time Thomas had died, Mary appears to have been living at 57 Gunterstone Road, West Kensington, London; and the 1939 Register tells us that Mary was living at the time at 32 Ferry Road, Barnes, London with her daughters Mamie and Kate. 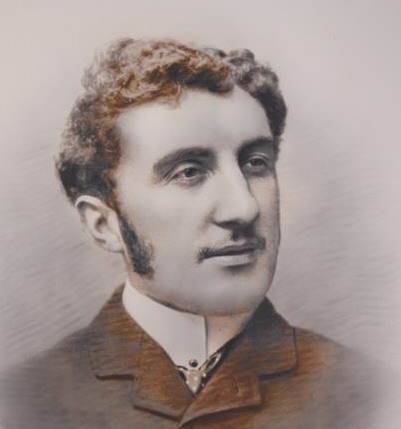 Mary married Thomas Aloysius HUSSEY, son of Thomas HUSSEY and Agnes DEVINE, in 1886 in Kensington, London. Thomas was born in 1864 in probably 9 Mayfield Place, Kensington, London. 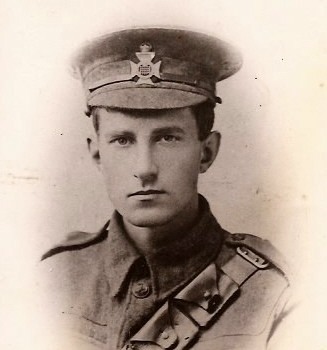 He died on 30 Mar 1916 in London. Thomas, who was educated at St. Edmund's Roman Catholic College in Hertfordshire, followed in his father's footsteps and became a builder. Thomas and his brother, James, were to marry two sisters, Mary and Jane Butler. It is possible that the two brothers met the two sisters through their families having possibly been neighbours at some point because at the time of the 1881 census, the Butlers were living at 32 St. Mary Abbots Terrace in Kensington (they later moved but it is not known when), and at the time of the 1891 and 1901 censuses, Thomas's parents were living at 23 St. Mary Abbots Terrace (having moved there sometime after 1884). Or perhaps the connection is through Mary and Jane's younger brother, William, who may have attended St. Edmund's at the same time as some of Thomas's brothers. It is known that Thomas and his family were living in Albert Hall Mansions, Kensington, built by Thomas's father, from at least 1891 to 1901. It appears that by 1911 Thomas was living apart from his wife, Mary, and their children as he is listed alone at a separate address in the census of that year at 150 Blyth Road, Fulham, London. It is thought that Thomas went to the United States to work at one point but no emigration records have been located to support this. Thomas died in 1916, aged about 52, of sarcoma of the spine and post-operative shock at the National Hospital, Queen's Square, Holborn, London. His home address at the time was 110 Baron's Court Road, West Kensington (where his son Laurie was living in 1915). Mary (Mamie) Agnes HUSSEY was born on 9 Apr 1888 in probably Albert Hall Mansions, Kensington, London. She died on 19 Dec 1953 in 8 Hazlewell Road, Putney, London. Mamie was a social worker with London County Council and after the passing of the Education Act of 1918 worked mainly in the provision of medical services in schools. Although she lived in south west London, much of her work was carried out in the East End. Her occupation in the 1911 census is given as 'Health Visitor', and according to the 1939 Register Mamie was a Children's care organiser(?) L.C.C. [London County Council] Public Health Dept." At the time of the 1911 census Mamie she was living with her mother and siblings at the home of her grandfather Thomas Hussey. By 1918 she had moved to 110 Barons Court Road, Kensington where she lived with her mother, brother Bob and sister Kate. Nine years later she was in 57 Gunterstone Road, Hammersmith with her mother, Kate and brother Laurie; and in 1939 she was living at 32 Ferry Road, Barnes with her mother and Kate. Towards the end of her life she lived with Laurie at 8 Hazlewell Road, Putney. Thomas (Tom) Leonard HUSSEY was born on 26 Nov 1889 in probably Albert Hall Mansions, Kensington, London. He died on 23 Mar 1909 in 59 Rowan Road, Hammersmith, London. There is an entry for a Thomas L. Hussey, aged 11, born in Westminster, London, in the 1901 census return for the household of Tom's uncle, James Hussey, in Hammersmith. Thomas died at the age of 19 of "Heart Disease, Aortic Regurgitation [leaking of aortic valve], Anasarca [accumulation of fluid beneath skin]". Kathleen (Kate) Mary HUSSEY was born on 29 Jan 1892 in probably Albert Hall Mansions, Kensington, London. She died in 1977 in Richmond upon Thames registration district, Surrey. According to the 1911 census Kate, who was living with her mother and siblings in Hammersmith, was a saleswoman. In 1917 she enlisted in the British Red Cross as a member of the V.A.D. (Voluntary Aid Detachments), and after the war she trained to be a nurse, later working in Kings College Hospital, London. The 1939 Register tells us she was living at that time at 32 Ferry Road, Barnes with her mother and sister Mamie and that she was an assistant at a charity organisation. Kate also lived in Wimbledon at some point. She never married. + 51 M iv Robert (Bob) Edward HUSSEY was born on 3 Jan 1893. He died on 8 Oct 1947. Edward (Ted) Wilfred HUSSEY was born in 1895 in probably Albert Hall Mansions, Kensington, London. He died on 16 Aug 1917 in Passchendaele, Belgium. He was buried in Tyne Cot Cemetery, Passchendaele, Belgium. At the time of the 1911 census Ted was a 'boy clerk' in the Civil Service. He enlisted in the army in May or June of 1915, joining the Queens Westminsters Regiment. He had attained the rank of Lance Corporal when he was killed at thae age of 22 at Passchendaele, near Ieper (Ypres), Belgium in August 1917. He is buried in Tyne Cot Cemetery, Passchendaele (Plot XLVI, Row H, Grave 1). The cemetery, the largest Commonwealth war cemetery in the world in terms of burials, is situated 9km north east of Ieper (Ypres), near the village of Zonnebeek. Ted's name is listed on a World War I memorial plaque on a wall of Brook Green Church in Hammersmith where he had been an alter-server. Laurence (Laurie) Joseph HUSSEY was born in 1896 in probably Albert Hall Mansions, Kensington, London. He died in 1970 in London. World War I military records (attestation, discharge and pension papers) were located for Laurie, who lived at 110 Baron's Court West in Kensington at the time of his enlistment in January 1915. The records tell us that Laurie was a fitter by trade and was 5 feet 11 inches tall with grey eyes and black hair. He was sent to France with the Royal Engineers regiment in April 1917. However, only two days after his arrival he "fainted on parade following heavy march with full pack up hills" near Rouen and it was discovered he had "advanced valvular disease of the heart". He returned to England for treatment but was deemed unable to return to military service and he was given a discharge from the army in March 1918. Laurie subsequently worked as a sales manager. He never married. Electoral registers tell us that Laurie was living with his mother and sisters at 57 Gunterstone Road, Hammersmith in 1927 and 1929. In 1941 he lived at 31 Westleigh Avenue in Putney where his brother Bob had lived previously; by 1948 he was living at 8 Hazelwell Road in Putney and was still at that address in 1966. 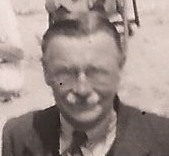 A Laurence J. Hussey, born on 2 September 1896 is listed in the 1939 Register as a guest at The George Hotel, The Bridge, Walsall, Staffordshire. His occupation was "Traveller Engineers Stampings & Drop Forgings". As this Laurence appears to be the only single Laurence/Lawrence Hussey of a similar age to our Laurie in the entire Register I think it likely that this is our Laurie. Eileen Mary HUSSEY was born on 23 Dec 1903 in Hammersmith, London. She died on 7 Sep 1960 in Putney, London. Eileen who was a teacher in London. In 1939 we know she was teaching history at the Royal School For Naval And Marine Officers' Daughters in Isleworth. She lived in Wimbledon and died in Putney Hospital aged 57. 36. Jane Frances BUTLER (Jane LYNCH , Mary Ann EGAN , 'unknown' ) was born in 1867 or 1868 in 18 Edwardes Square, Kensington, London. She died on 9 Mar 1946 in 35 Dewhurst Road, Hammersmith, London. She was buried on 13 Mar 1946 in St. Mary's Cemetery, Kensal Green, London (grave no. 2845 XP). Jane and her sister Mary married two brothers. Jane married James Hussey and Mary married his brother Thomas. Jane's granddaughter Sheila Hussey remembers that she and her sisters used to refer to Jane as 'Granny Miaow' because when seated she nearly always had a cat perched on her knee. I have heard her described as a "formidable woman". The only Jane Hussey born between 1867 and 1869 (from FreeBMD we know that Jane's birth was registered in the first quarter of 1868) listed in the 1939 Register was a Jane F. Hussey born on 3 December 1867. As it was not uncommon for December births to be registered in the first quarter of the following year I was inclined to think that this entry related to our Jane. However, the Jane in the Register is resident in a Catholic-run care home at 14 Westbrooke, Worthing, Sussex and, as far as we are aware, our Jane lived most of her married life at 35 Dewhurst Road in Hammersmith. Certainly that is where she died. The Jane in Worthing is therefore either not our Jane at all or else our Jane spent time at the Worthing care home 1939, recuperating from an illness, perhaps. According to her death certificate, Jane died of (1a) cerebral haemorrhage, (1b) acute toxaemia, (1c) quincy [severe tonsilitis] and (2) chronic valvular disease of the heart. The informant was her son Martin. Jane married James HUSSEY, son of Thomas HUSSEY and Agnes DEVINE, on 13 Aug 1891 in Our Lady of Victories Church (Pro-Cathedral), High St., Kensington. James was born on 27 Sep 1865 in 9 Mayfield Place, Kensington, London. He died on 3 Apr 1936 in West London Hospital, Hammersmith, London. He was buried on 6 Apr 1936 in St. Mary's Cemetery, Kensal Green, London (grave no. 2845 XP). James went to school at St. Edmund's College near Ware in Hertfordshire and went on to become a solicitor. At the time of the 1901 census, he and his wife, Jane, were living at 38 Westcroft Square in Hammersmith, and at the time of the 1911 census and the time of James's mother's death in 1913 they were at Olympia Mansions in Hammersmith. They later moved to 35 Dewhurst Road, Brook Green, Hammersmith where they lived for many years. James was a talented organist and played regularly at his local church in Brook Green. James seems to have retired from legal practice by 1919 because the marriage certificate of his son Michael from that year gives James's occupation as 'Clerk, Board of Trade'. James died of a malignant prostate, the same disease to which his father had succumbed. On his death certificate, James's occupation is given as church organist. Weaving me webs of magic and myth. To coral islands - Cathay - Camelot. Thin as the mists of time. Into infinities of cosmic space. You were my Homer and my Gutenberg. Suffused my youth with light. You smiled at me again out of his eyes. Jane and James were married by Jane's uncle Rev. Edward Lynch, assisted by another uncle of Jane's, Rev. Robert Butler, and an uncle of James, Rev. James Hussey. Jane and James had the following children. 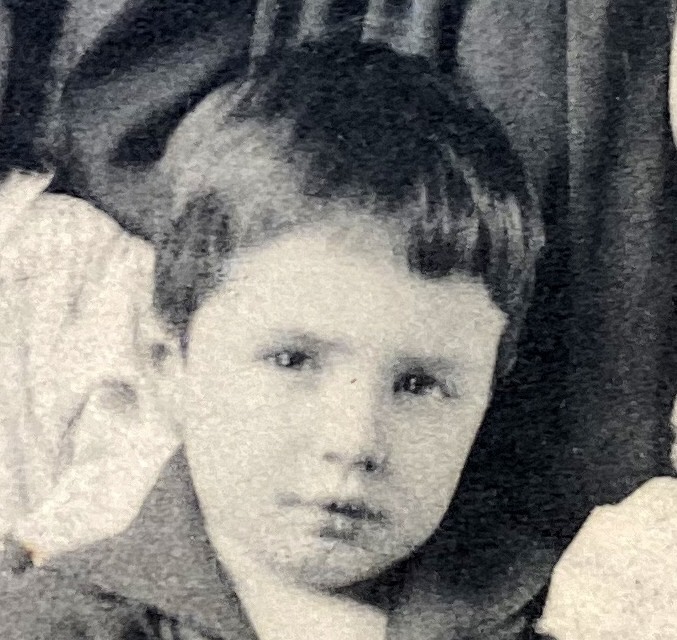 + 55 M i Michael Robert HUSSEY was born on 6 Jun 1892. He died on 7 Mar 1980. Philip James HUSSEY was born in 1894 in Hammersmith, London. He died on 15 Sep 1916 in Rouen, France. He was buried in St. Sever Cemetery, Rouen. 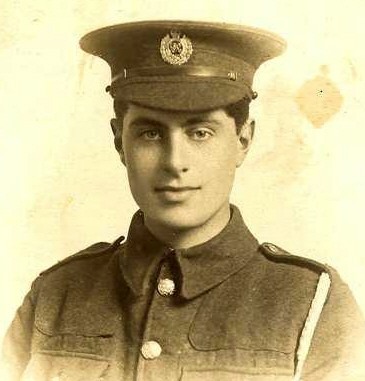 Philip worked for The London, Brighton and South Coast Railway (LB&SCR) prior to enlisting for service in World War I. He was sent to France as a rifleman with the Queen's Westminster regiment and died from wounds sustained in the Battle of the Somme. His injuries had not been life-threatening, but conditions were such that he developed gangrene and died in a British army hospital in Rouen. He is buried in St. Sever Cemetery (not the adjoining St. Sever extension), Le Grand Quevilly, Rouen (Plot B, Row 19, Grave 3). Philip's name appears on a World War I memorial plaque on a wall of Brook Green Church in Hammersmith where he had been an alter-server. His name is also included on a bronze panel at Victoria Station in London commemorating members of LB&SCR staff who were killed in the war. Philip's mother, Jane, always carried with her the official letters regarding her son's death and was distraught when her handbag, containing the letters, was stolen. The thief must have realised their importance because some days later the letters were returned to her through her letterbox. + 57 M iii Stephen HUSSEY was born on 25 Jul 1895. He died on 7 Sep 1978. Anne (Nan, Annie) Mary HUSSEY was born on 3 Jun 1899 in Hammersmith, London. She died in 1990 in Hammersmith, London. She was buried in St. Mary's Cemetery, Kensal Green, London. Nan trained as a teacher but worked as a civil servant. According to the 1939 Register she worked at the "Ministry of Health Insurance Department". She may also have worked at the Department of Housing. Nan lived with her sister, Winnie, in the family home at 35 Dewhurst Road, Brook Green, Hammersmith, London. Towards the end of their lives she and Winnie moved to Nazareth House nursing home in Hammersmith. Martin James HUSSEY was born on 16 Jan 1901 in Hammersmith, London. He died in 1971 in Hammersmith, London. After World War I Martin worked with his brothers Stephen and Austin in the family building business, Hussey Bros. (Builders) Ltd., based in Queensway, Bayswater, London. Electoral registers tell us Martin was living in the family home at 35 Dewhurst Road, Hammersmith, London in 1929 and 1930; and he was still at the same address at the time of the 1939 Register. Interestingly, Martin's brother Michael and his wife, Mildred, were living next door at no. 37 Dewhurst Road in 1939. The 1939 Register describes Martin as a "builder's estimator and supervisor". After his marriage in 1942, Martin and his wife, Marie, lived at 15 Ayr Court, Monks Drive, Ealing, London where they lived for many years before moving to 30 Rowan Road, Brook Green, Hammersmith around 1962. Martin and Marie had no children. Martin married Marie HURST in 1942 in Hammersmith, London. 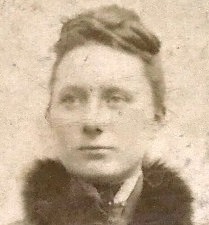 Marie was born about 1910. She died. Unfortunately we have no information on Marie. Winifred (Winnie) HUSSEY was born on 23 Nov 1902 in Hammersmith, London. She died on 12 Mar 1993 in Hammersmith, London. She was buried in St. Mary's Cemetery, Kensal Green, London (grave no. 36 FP). Winnie was a teacher, retiring from St Mary's School, Kensal in London in 1964. She lived with her sister, Nan, in the family home at 35 Dewhurst Road, Brook Green, Hammersmith, London. + 61 M vii Augustine (Austin) Thomas HUSSEY was born on 24 Apr 1907. He died on 16 Nov 1992. 37. William John BUTLER (Jane LYNCH , Mary Ann EGAN , 'unknown' ) was born about 1869 in possibly 6 Brompton Square, Kensington, London. He died on 2 Nov 1933 in Dublin. He was buried in St. Fintan's Cemetery, Sutton, Dublin. It is possible that William may have attended school at St. Edmund's Roman Catholic College in Ware, Hertfordshire: in the course of my research into the Hussey family from Kensington (members of which attended St. Edmund's and later married into William's family, I came across information on a William Butler who attended the college from 1880 until 1882 and who was born about 1870 in Brompton, Middlesex; our William above was born about 1870 in Brompton which makes me think they could be the same person. Our William went on to become a musical instrument maker in the family business, frequently visiting its Dublin branch. Around the time of his marriage in 1906 to Nellie, one of his employees, he moved permanently to Dublin. The Dublin shop was located at that time in Monument House at 34 Bachelor's Walk and business was good, due in part to the fact that in those days every town had its own band (usually fife and drum). Part of William's work involved taking the train to large towns and then cycling to the smaller towns where he would presumably take orders for band instruments. While the company manufactured many of its own instruments (bagpipes, drums, flutes, bugles, etc.) William also travelled to continental Europe to buy violins, accordians and other instruments. About seven people were employed in the workshop, while one person worked solely on gramophone repairs. The shop also had a piano showroom. The London branch of the business, run by William's brother, George, closed in 1913. The Dublin business appears to have encountered serious problems from about 1916. During the Easter Rising of that year the Dublin shop was taken over by rebels, who emptied the building of its musical instruments, some of which were later found on the bed of the River Liffey at low tide. To oust the rebels, British forces shelled the building from what was then The Red Bank Restaurant on D'Olier St. The shop was badly damaged and the business was relocated the following year to the ground floor of nearby 2 Lower Abbey St. The family home up to this time appears to have been at this address and it seems that the family moved to Howth, Co. Dublin around this time. By the early 1920s Irish towns no longer had their own bands as the authorities apparently regarded a band at that time as an "unlawful assembly" and band members actually buried their instruments (many of which were brought back to Butlers years later for repair). William's business suffered as a result. Around this time too William's wife, Nellie, died. Further troubles were encountered during the Civil War (1920-1923) when, on 6 February 1923, the IRA targeted the Pathé Frères cinema company which occupied the first and second floors of 2 Lower Abbey St. A number of armed men entered the premises, poured petrol around the Pathé Frères offices and set it alight. It is thought that the men also planted an incendiary bomb as an explosion followed the fire, causing a number of Pathé Frères employees to be thrown off their feet as they fled the burning building. Miraculously, nobody was killed but the building was badly damaged. Although William did receive a small amount of compensation as a result of the Damage to Property Compensation Act of 1923, there was no proper insurance cover because the damage was caused by an act of war. William's company was by now in severe financial difficulty. It appears William and his children moved back to their old Abbey St. home in 1927 and I have been told that the company closed down in the same year. However, from a newspaper clipping in a family scrapbook, dated 21 November 1933 (publication unknown), we know that "The firm of Messrs. J. Butler...is still being carried on at 2 Lr. Abbey St., although the head of the firm, Mr. W. J. Butler, died a few weeks ago." William had died in Jervis St. Hospital in Dublin on 2 November of pneumonia and cardiac failure. William had a cousin (type unknown) from Dublin named Kate Lynch (William'a mother's maiden name was Lynch), who worked in Paris in the mid-1910s, possibly as a governess. The story goes that she subsequently moved to St. Petersburg in Russia with the same family she worked for in Paris. Following the departure of this family from St. Petersburg, Kate stayed on as governess to the family of the crown prince, later Czar Nicholas II. It is said that during the Revolution of 1917, she escaped from St. Petersburg in a cattle-truck. A 1901 census record has been located for a Kate Lynch, a 27-year-old Dublin-born governess, who may possibly be our Kate. She is described in the census return as a visitor in the household of Joseph and Henrietta Scott who lived at 9 Synott Place, Inns Quay, Dublin and who had three children aged 10 and under. Kate had a brother, John J. Lynch, an electrician who spent many years in West Africa, including 10 years working for the Ashanti Goldfields Corporation in what is now Ghana. He was also a "Togoland Volunteer" during the Togoland Campaign of 1914. We also know, from a letter to a newspaper in 1916, that John and Kate returned to Dublin for a holiday in March or April of that year and were caught up in the 1916 Rising. This letter, from a newspaper cutting in a family scrapbook (publication name and exact date unknown), was written by William and states that John "was on leave to meet his sister, who had been in the war area of France for 18 months, and they were to spend a quiet holiday in their peaceful native town. Mr Lynch was prevented from 'phoning from the G.P.O. by a man who pointed a pistol at him. He spent his holiday watching the fighting in many parts of the city." We have other information about John from UK incoming ship passenger lists. A list from March 1916 - when he was on his way to Dublin to meet up with Kate - tells us that he travelled from Seccondee (now Sekondi), Gold Coast (now part of Ghana) to Plymouth and his age was 45, which means he was born about 1870. A list from 1917 (Sekondi to Liverpool) has an address written underneath his details: 5 Leinster Road, Rathmines, Dublin; and a 1920 list (again Sekondi to Liverpool) gives an address of 59 Edenvale Road, Ranelagh, Dublin. Furthermore, the 1901 census of England lists a 30-year-old Dublin-born apprentice electrical engineer named John Lynch who is boarding in Broadstairs, Kent. I think it likely that this is our John J. Lynch. I would love to establish how exactly John and Kate are related to William. If you can help, please email Helen@HelensFamilyTrees.com. There are still Butler-made instruments in existence, both privately-owned and in museums. The Kenneth G. Fiske Musical Instrument Museum in Claremont, California, for example, has a Butler keyed bugle made in Dublin c. 1835. The Edinburgh University Collection of Historic Musical Instruments has a Butler flute and cornet (dates of manufacture unknown), and the Horniman Museum in London has a Butler harp acquired pre-1900, bright green in colour with Irish images, including round towers and an Irish wolfhound, painted on the soundboard. And the National Museum of Ireland has a Butler bugle in its Easter Week collection. This bugle, manufactured c. 1915, has an interesting history in that it was awarded to the Irish Citizen Army in 1915 for taking first place in a drill competition; then, following the surrender of Irish forces (which included the Irish Citizen Army) in the 1916 Rising, it ended up in the hands of the British Provost Marshall who subsequently gave it to a Dr. Laurence Moran who in turn gave it to a brother of Fianna Fáil TD (Teachta Dála, meaning member of parliament), John McCann. John McCann's brother later presented it to Éamon de Valera, participant in the Rising and founder of Fianna Fáil, who would, in 1959, be elected President of Ireland. On 4 September 1948, Éamonn de Valera donated the bugle to the National Museum of Ireland. "From Butler's monument house corner he [Leopold Bloom] glanced along Bachelor's walk." (p. 151 of the Penguin Edition of 1960). William married Eleanor (Nellie) GILROY, daughter of John GILROY and Mary REILLY, on 13 Aug 1906 in St. Andrew's Church, Westland Row, Dublin. 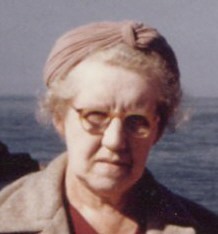 Eleanor was born on 6 May 1885 in Lurgan, Ballyjamesduff, Co. Cavan. She was christened on 10 May 1885 in Lurgan, Ballyjamesduff, Co. Cavan. She died on 16 Nov 1922 in "Lismeen", Howth, Dublin. She was buried in probably St. Fintan's Cemetery, Sutton, Dublin. Nellie was from Lismeen in the parish of Lurgan, near Ballyjamesduff, Co. Cavan. She worked in the Butler musical instrument shop in Dublin and that was how she met her future husband, William, who ran the business from London. Her address at the time of the marriage was 3 Lower Sandwith St., Dublin, while John's was 27 Brook Green, London. Nellie and William lived on the Summit in Howth, Co. Dublin in a house they named "Lismeen". Nellie died aged only 37 from "acute gastritis". Her daughter, Jennie, was only 15 years old at the time and her son, George just five. Jane (Jennie) BUTLER was born on 24 Jul 1907 in Dublin. She died on 5 Sep 2004 in Dublin. She was buried in St. Fintan's Cemetery, Sutton, Co. Dublin. I have been told that the Butler musical instrument business closed due to financial difficulties in 1927 but the company was still admvertising in national newspapers up to at least 7 September 1931. Furthermore, a newspaper clipping in the family scrapbook, dated 21 November 1933 (publication unknown), tells us that "The firm of Messrs. J. Butler...is still being carried on at 2 Lr. Abbey St., although the head of the firm, Mr. W. J. Butler, died a few weeks ago". However, it does appear that the business did not remain in operation for much longer after William's death. 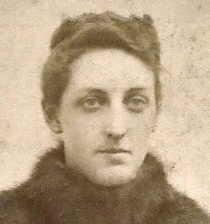 Jane married John HANNIGAN. John was born about 1917. He died on 21 Oct 1999 in Dublin. He was buried in St. Fintan's Cemetery, Sutton, Co. Dublin. John worked at the Hammond Lane Foundry in Dublin. Following his retirement he worked as manager of the Woodbrook Golf Club, and later the Bray Golf Club, both in Co. Wicklow. He and Jennie lived in Priory Grove in Stillorgan in Dublin. They had no children. + 63 M ii George BUTLER was born on 29 Aug 1917. He died on 2 Nov 2014. 38. Winifred Mary BUTLER (Jane LYNCH , Mary Ann EGAN , 'unknown' ) was born about 1876 in Kensington, London. She died on 2 May 1919 in Park Cottage, Wexford. The name Winifred Butler is listed in the the 1891 census return for a boarding school on Twickenham Road in Isleworth, Middlesex. This may well be our Winifred because the Winifred from the census was aged 15 at the time which is the approximate age our Winifred would have been. By the time of the 1911 census of Ireland, Winifred was living in Mount Talbot, Co. Roscommon. Listed with her in the census return are her three children. At the same time, her husband, John, was in Wexford (where a branch of his nursery business was located). In 1916 the family was living in Rathdrum, Co. Wicklow, and at the time of her death in 1919 Winifred was living at Park Cottage (located between Ballyboggan and Park) just outside Wexford town. Her death certificate tells us that she died of "Cancer of Uterus 3 years, Cancerous Cachexia", cachexia meaning wasting. Winifred was just 43 years old when she died. Winifred married John GALVIN, son of James GALVIN, in 1901 in Fulham or Hammersmith, London. John was born about 1857 in possibly Mount Talbot, Tisrara, Co. Roscommon. He died on 14 Apr 1941 in Park Cottage, Co. Wexford. He was buried in St. Ibar's Cemetery, Crosstown, Wexford. The Galvin family had operated a nursery business in Co. Roscommon since the 1790s. The dictionary of British and Irish Botanists lists a William Galvin (1756-1832), a "nurseryman with Thomas Galvin, Mount Talbot, Co. Roscommon", presumably relatives of John above. From about 1890 John and his brother James ran the nursery in the grounds of Mount Talbot House (owned by the Talbot family) in Tisrara, Co. Roscommon. The brothers then set up a branch of the nursery in Mount Avon, Rathdrum, Co. Wicklow (where it is known John was living with his wife and children in 1916). By the early 1930s the business had expanded to Co. Wexford with a branch at Park Cottage, just outside Wexford town, which John ran with his son Seamus. The family lived in Park Cottage, a large property, which was eventually sold in 1976. There is a 1901 census record for a John Galvin, a 43-year-old "nurseryman / county councillor" from Mount Talbot in Tisrara, Co. Roscommon. This is almost certainly our John above. The John Galvin from the census wasn't married at this time and the only other occupants of the household were a nursery foreman, a servant and two visitors, the visitors being a nephew named William Finerty, aged 20, who was a clerk of petty sessions, and a cousin named William Byrne, aged 35, who was a veterinary surgeon. John was living in Stoneybatter, Wexford at the time of the 1911 census while Winifred and the children were back in Mount Talbot. Presumably John was working in Wexford. His occupation is given on the census return as nurseryman and county councillor. John died in his mid-eighties of "gastric carcinoma" (stomach cancer). Mary Winifred Johanna GALVIN was born on 24 Jun 1902 in Mount Talbot, Co. Roscommon. She died on 29 Mar 1930 in Fitzwilliam Nursing Home, Dublin. Mary, who was a doctor, lived in Wexford town. She was just 27 years old when she died. According to a family source she died of tuberculosis, contracted while carrying out her medical duties, while her death certificate tells us she died of "septicaemia and meningitis". Her address at the time of her death was 98 North Main St., Wexford. Seamus Robert GALVIN was born on 29 Jul 1904 in Mount Talbot, Co. Roscommon. He died in Apr 1993 in Dublin. In 1949 Seamus became a director of the Portmarnock Country Club in Co. Dublin where his brother, John, was also a director. It is not known if he was living in Dublin at this time but it is known that at some point he moved from Co. Roscommon to Park Cottage, Wexford where he and his father ran a branch of the family's tree nursery. In 1976, Park Cottage was sold and Seamus moved from Wexford to Dun Laoghaire, Co. Dublin where he lived for the rest of his life. He never married. + 66 M iii John Patrick GALVIN was born on 16 Dec 1906. He died on 19 Mar 1996.